Cows is a type of animal that is often cultivated by humans. Not only used alone but meat, milk from these cows also have many uses in human life. Cows consists of several types ranging beef cattle, dairy cows, or cows brahman. Broadly speaking, some people are more often cultivate dairy cows and beef cattle for meat and milk will continue to be needed. Cow - a cow consists of size and some of them included in the classification of cattle in the world. As the largest cow certainly has a weight that exceeds the limit - average. The following 7 world cattle were found from several countries, including Indonesia. Blossom is the name of a cow owned by Patty Hanson and stay in a farm in Orangeville, the state of Illinois, United States. In the past year, the staff of Guinness of the records went to the farm and take pictures along with their owners Patty Blossom. Patty began to have Blossom since the cow was about 8 weeks. Since the birth, body size Blossom already looked twice as large when compared to other cattle in general, also with age, the body also bertmabah getting bigger. Blossom has been listed as the world's tallest cow with 1.95 meters tall, and died at the age of 13 years due to an injury to his leg. Blossom after death, the Guinness World Recordsmemberikan new degree in farm animals, namely as the world's tallest cow that ever existed. The previous highest record for a cow yan has been listed in the Guinness World Records held by a cow named Mount Katahdin, which is a cow of the Holstein-type Durham, who lived from 1906 to 1910 reached 1.88 meters height and circumference of his body reached 3.96 meters. Its size is almost the same as a small elephant. Cows FH also included a superior type of dairy cow with milk production more than other types. This cow is able to produce up to 6359 liters of milk in a year with a percentage of fat 3-7 percent. This type of dairy cows ought to be cultivated because it can improve the economic welfare of society with the main requirement to have a superior seedlings. Chilli is a cow that has been getting MURI as the biggest cattle in Indonesia. The bulls are included in different types of cows FH. 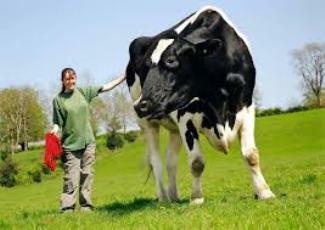 The weight of the cow is about 1 ton, while the height of the cow is about 1.97 meters. Britain cows included in the world with a weight of 1.6 tons from England. The beef cattle grow healthy weight so as to achieve the maximum and thus has a higher meat yield than cows in general. Since the birth of this cow is already postured body fat so that the cow's gestation period is faster than cattle age. * The rest, including the type of oxen, ox next highest in the world. Ox weighs 1.25 tons, with a height of 6 feet 6 inches or about 195 centimeters. The ox is the highest in the UK. Ox tertinggidi world is that a calf chianina Fiorino that has a 6 foot 8 inches or about 2.05 meters withers on 8 Novembre 2007 and owned by Antonio Sola Italy. The highest ox is Bellino, cattle, including the type that has a high chianina 2,027 m (6 feet 7 inches). Giuseppe Sola (Italy) owner and has performed measurements in Rome, Italy, on March 27, 2010. That's seven cows and bulls in the world's largest and highest ever dibudiyakan by farmers from various regions. Until now, the descendants of cattle - cows still be maintained properly so that its existence is not extinct.